APIs are an engine for innovation. They enable developers to easily build rich and dynamic web and mobile app experiences. Yet per OWASP data, most APIs lack basic capabilities to detect, prevent, and respond to automated attacks. 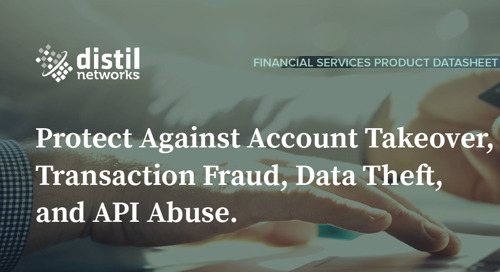 Nefarious competitors, hackers, and fraudsters reverse engineer mobile apps that connect to API endpoints. Once inside the API, they use bots to scrape data, takeover accounts, commit fraud, and deny API service to other apps and users. Sounding the alarm bell, OWASP has now added “Underprotected APIs” to the OWASP Top Ten. Protection from Bad Bots - Rest easy knowing your mobile apps, and API servers are protected from bad bots. Brings Bot Mitigation to Mobile App APIs - Verifies that only legitimate humans on real mobile devices are accessing your mobile applications. 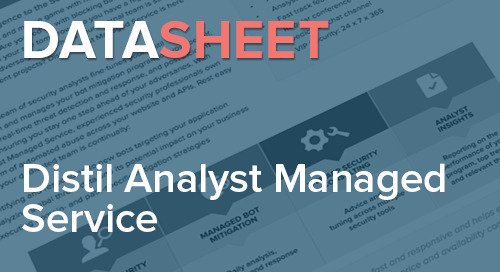 Complements API Management Solutions – Deploy as a standalone solution or add advanced bot defense to your existing API management solution or API gateway. Bot Defense Inside Your App – Distil Mobile SDK places advanced bot detection inside your mobile app. Changes the Game – Makes abusing your mobile app APIs cost prohibitive. Forces all but the most heavily resourced and determined adversaries to throw in the towel.